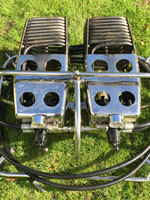 Cameron MK4 Super double burner, built 1991, approximately 350 hrs. CB579-1. Vapour pilot lights, REGO fittings. 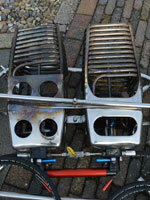 Quiet multi-hole jets fitted to both main and cow burners. According SB27, new liquid and vapour hoses will be fitted at sale. Cameron royal blue burner bag all in excellent condition. Will be sold with EASA Form 1. Currently stored near Newbury, Great Britain. Cameron MK4 Super double burner (CB579/2) built 1990. Vapour pilot lights, REGO fittings. 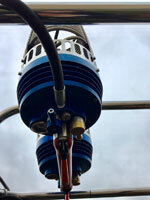 New hoses (2x liquid, 2x vapour) installed in 2012. Comes with EASA Form 1. 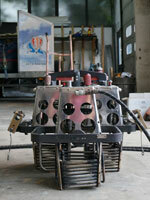 Ultramagic Mk21 triple burner, built 2004, 342 flights. Liquid pilot lights, REGO fittings. No burner frame included. Regularly serviced, in excellent condition. Comes with fresh EASA Form 1. Immediately available. Currently stored in Spain but can help to arrange shipping. 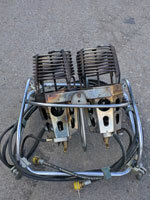 Raven HP3T double burner, built 1995, liquid pilot lights. In good condition. 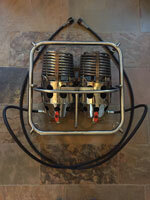 Raven HPVID / HP3S triple burner, built 1991, liquid pilot lights, in good condition. 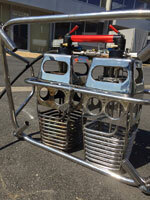 Cameron Super Shadow double burner, liquid pilot lights, REGO fittings. Hoses dated 2013. 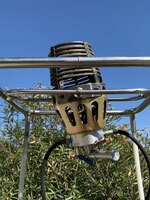 Complete overhaul, including new pilot light jets and filters. 1 new coil and can with new multihole jets fitted. Comes with fresh EASA Form 1. Immediately available. 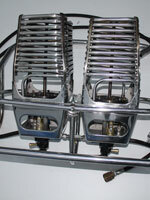 Lindstrand LBL Jetstream triple burners. Liquid pilot lights, REGO fittings. In frame with metal heat shield. 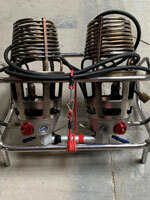 Cameron Stealth double burner, built 1993, liquid pilot lights, REGO fittings. Hoses valid until 2022. 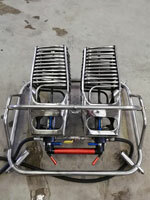 In height adjustable frame with flexible corners. Last inspected 05/2018. 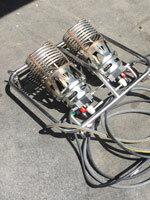 Cameron MK4 double burner (CB392). Vapour pilot lights, REGO fittings. 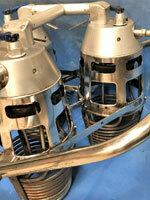 Retrofitted with Bonanno valves, one waverly liquid fire valve. Nice straight coils, new hoses and new stainless steel back nut REGO fittings fitted 12/2018. In standard Cameron flexi corner frame with new nylon corner buffers. SB20 and SB27 carried out. All in excellent condition. Comes with EASA Form 1. Kubicek Komet Duo Plus burner, built 04/2003, 462 flights, 589 hrs. Vapour pilot lights, REGO fittings, hoses valid until 09/2024. 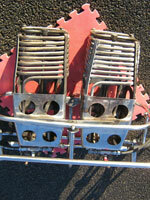 Burner in excellent condition, fully tested, ready to fly. Cameron Stealth double burner, built 2006, 300 flights/hrs. Liquid pilot lights, REGO fittings. Hoses replaced in 2016. 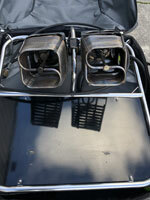 Cameron Stealth / Shadow double burner (CB2101), liquid pilot lights, REGO fittings with dust caps. Maintenance carried out in January 2019, with 2x pilot light serviced, 2 new hoses and 2x new piezo igniters fitted. Standard frame with flexible corners with nylon buffers. Comes with EASA Form 1. 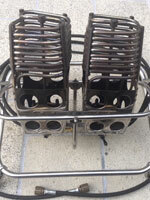 Cameron Stealth / Shadow double burner, built 1999, liquid pilot lights, REGO fittings. Hoses dated 2008. In frame with heat shield. Custom made burner bag. Cameron Sirocco double burner, liquid pilot lights, REGO fittings. Hoses dated 2013. In good condition, last inspected 08/2018. Schroeder Optima IV double burner, built 1989, vapour pilot lights, REGO fittings, needs new hoses. 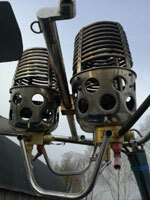 Ultramagic MK21 double burner, built 12/2005, approximately100 flights/hrs. Liquid pilot lights, REGO fittings. Regularly serviced, comes with EASA Form 1. Cameron Stratus single burner, built 2007, 300 flights, 335 hrs. Liquid pilot lights, REGO fittings. Hoses dated 10/2010. In frame with fixed corners. Comes with EASA Form 1. 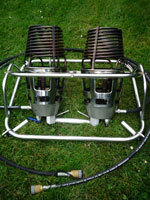 Ultramagic MK21 double burner, age and hrs unknown, liquid pilot lights, REGO fittings. Hoses dated 2016, gauges replaced 2017, refurbished 2018. In very good condition. Thunder & Colt MK3 double burner, built 1992, approximately 500 flights/hrs. Liquid pilot lights, REGO fittings, hoses dated 2008. Frame dimensions 70x70cm. Last inspected 06/2018. In good condition. Kubicek Komet Duo burner, built 2001, 400 flights/hrs. Vapour pilot lights, REGO fittings. Hoses dated 03/2019. 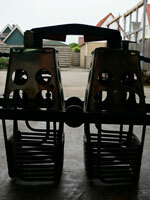 In height adjustable frame with flexible corners. Burner bag included. 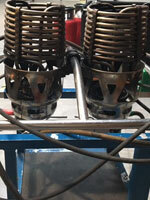 Recently serviced: hoses and pilot light valve stems replaced.